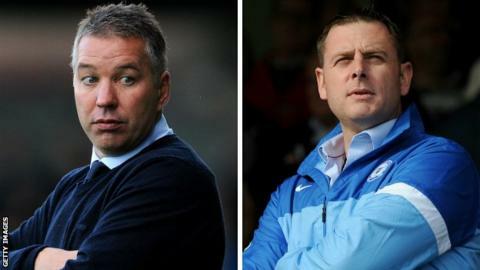 Peterborough manager Darren Ferguson accepts he could be dismissed unless his team's form improves soon. Posh have slipped to ninth in League One after losing five and drawing one of their last six games. Ferguson told BBC Radio Cambridgeshire: "If you continue losing games, you know what's going to happen. "If I was a betting man, I'd say he [chairman Darragh MacAnthony] doesn't want to do it, but I think he would have no choice." After ending his first stint as manager in November 2009 to take over at Preston, Ferguson returned to London Road less than 18 months later to replace Gary Johnson and led the club to promotion from League One via the play-offs. On taking the club up, he then maintained their Championship status, but despite a strong second half of the campaign could not prevent relegation the following season. MacAnthony has funded a subsequent push for promotion, but Ferguson's side suffered a play-off defeat by Leyton Orient at the end of last season and, having started this season with eight wins from 13 games, have begun to slip out of the promotion picture. "The chairman's been as supportive as he can be, with the run of games we've been on," said Ferguson. "It's very clear, also, that the pressure is on. That's got to be accepted in this situation. Obviously, we've got to get back to winning ways as quickly as we possibly can. "I'm really trying my hardest to see it through and turn the corner with this team. We're very positive. We want to try and get that elusive win." Posh face Orient on Saturday in what could be a key game for Ferguson's prospects.